Payroll using the Easiest Way. You just have to mount an iPad to the wall. Your employees will sign in and out of work using the iPad. Complete payroll data will be calculated automatically.Payroll using the Easiest Way. You just have to mount an iPad to the wall. Your employees will sign in and out of work using the iPad. Complete payroll data will be calculated automatically. 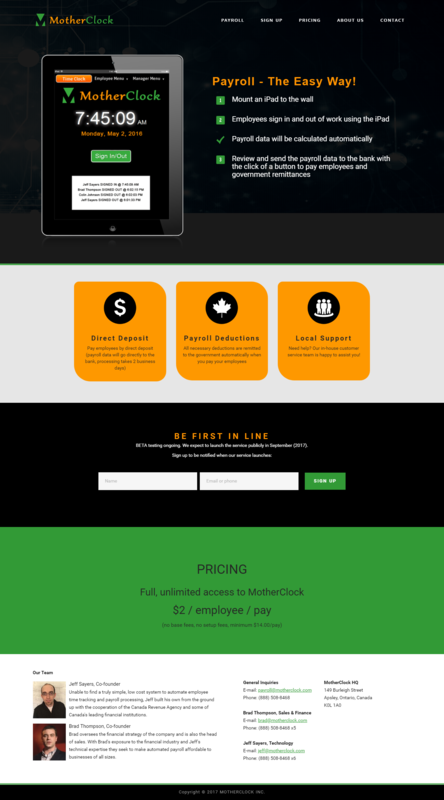 A low-cost system to automate employee time tracking and payroll processing. This system is built from the ground up with the cooperation of the Canada Revenue Agency and some of Canada’s leading financial institutions. With exposure to the financial industry and technical expertise, we’ve found and developed an automated payroll system affordable to businesses of all sizes. You’ll find all the useful features such as Employee Attendance maintenance, Employee Add/ Remove feature, Attendance using a unique pin and many more features. Simply review and send the payroll data to the bank with the click of a button to pay employees and government remittances.